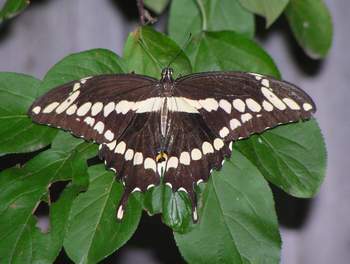 There are around 700 species of Butterfly in the United States, and over 17,500 in the world. 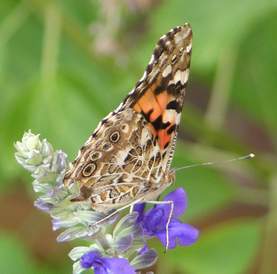 Here however, I have not referenced all the species in the US but instead have listed some of the butterflies that have visited my own garden here in North Central Texas along with their photos as and when I've been able to take them as well as some of the plants they frequent the most. This is a work in progress! 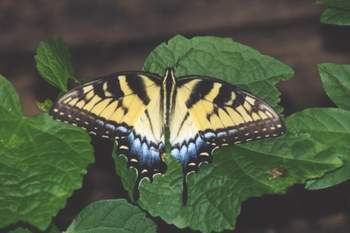 I have also included some of the many informative links out there that do reference most species of butterflies found here in the USA along with their food and nectar sources where known. Maximize this page to its largest size for best viewing. Either scroll down or jump using the links below. 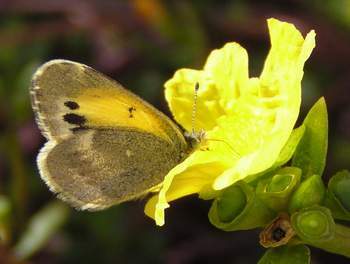 Butterflies are attracted to flowers that form a flat surface on which to land, especially ones where the centers are composed of many tiny flowers such as the daisy family for example. Unlike hummingbirds they do not have a long proboscis so they feed from flowers with much shorter "tubes." Also they prefer the pastel colors as apposed to the hot pinks and reds that hummers prefer. 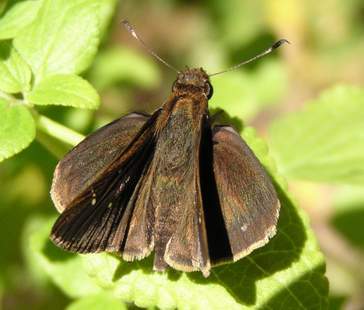 Butterflies need the temperature to be near 60 degrees before they can fly and apart from a couple of species such as the Satyrs and Wood nymph, usually always prefer to feed in the sun, as well as basking on rocks to warm their body temperatures. 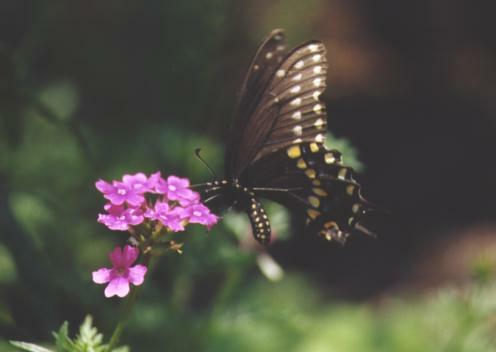 By planting a variety of sun loving "composite" type flowers (sunflower, coreopsis, aster) you will attract many species of butterfly to your garden. Remember to plant the low plants towards the front and the tall ones at the back. 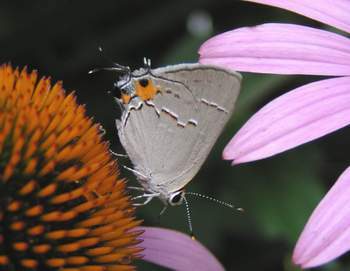 Where possible use native plants in your butterfly garden because not only are butterflies more attracted to the local plants but also the plants rely on the native butterflies for pollination. 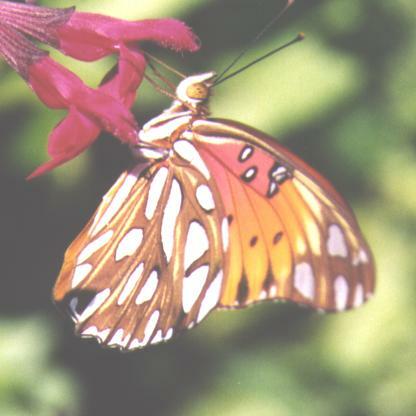 Also some of the plants are specific to certain butterflies providing certain chemicals which the butterfly can use as a defense, such as the Monarch Butterfly. So plant native where possible. Finally don't forget the caterpillars, plant for them too! 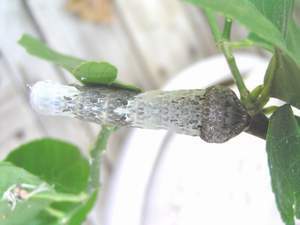 If you see holes appearing in your plants most often the caterpillar is coming toward the end of the caterpillar stage and should not kill your plants. I've not lost a plant yet :) Each butterfly has specific plants they lay their eggs on to give the new caterpillars the correct food and chemicals. 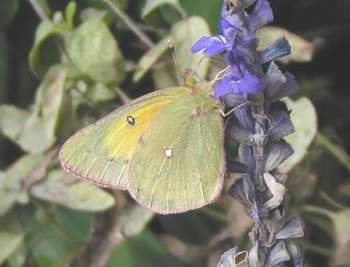 Knowing which plants are used as "host" plants will enable you to plant accordingly to attract specific butterflies. 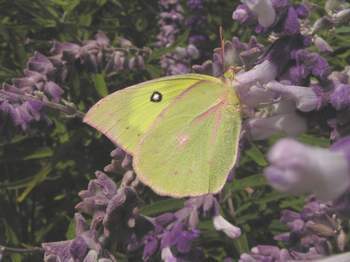 Below are some links I've found very useful in providing info on the butterfly species in your area as well as the plants to attract them. 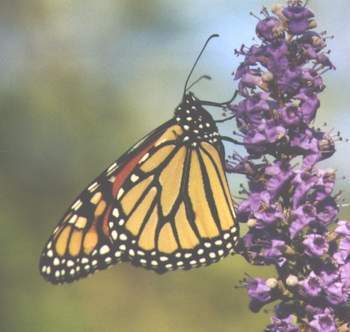 Monarch Watch Conservation, education and research. Also Monarch migration "tagging". 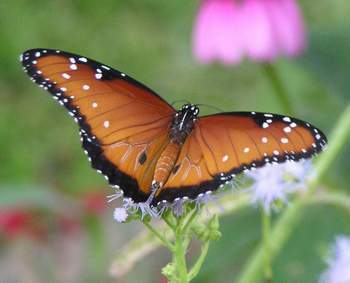 Texas Monarch Watch by Texas Parks and Wildlife. Monarch Waystation Create a Monarch Waystation. 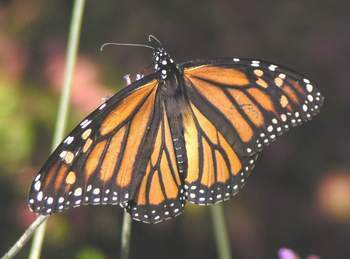 Monarch Migration by Journey North. 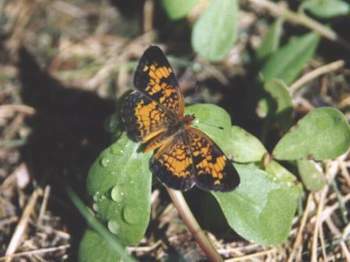 Butterflies of North America USGS photos, checklists, distribution. The Butterfly Website Links, Links, and more Links! 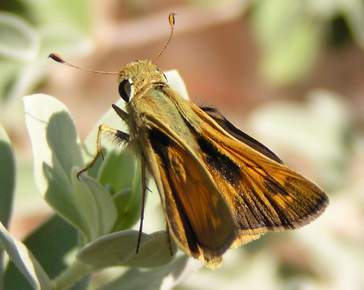 A Field Guide to Moths of Eastern North America - Charles V. Covell, Jr.
A beautiful bright orange butterfly, this one took to my Purslane & Salvia. Larval Host - Mostly Passion vines. Nectar - Purslane, Thistles, Impatiens, Lantanas. 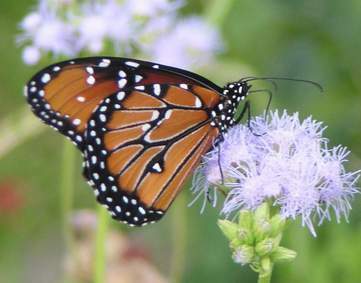 The Queen butterfly here was feeding on my perenial Ageratum. 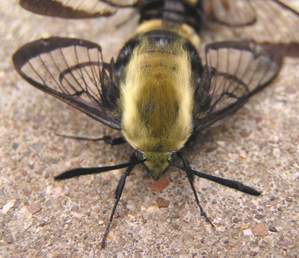 Larval Host - Queens are one of the "Milkweed" butterflies, along with Soldiers and Monarchs. Nectar Same as for Monarch, including Milkweed, Floss flower (annual Agerartum), Verbena, Zinnia, Prairie Blazingstart, Purple Coneflower, Sunflowers. 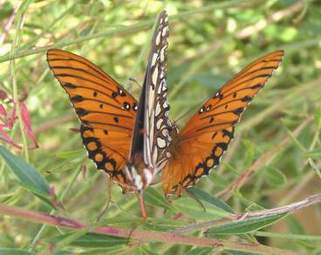 Here the monarch is feeding from a non native but Texas adapted tree, the "Chaste tree," or "Lavender tree." This is an aggresive plant reaching heights of 15 feet easily in a year. Larval Host - Milkweed species. Nectar - Milkweed, Lantana, Lilac, goldenrod, Cosmos, Zinnia. Found in open areas such as parks and gardens. This one kept trying to find large leaves to rest upon. Nectar - Azalea, Orange trees, Honeysuckle. Here on the leaves of Native Perennial "Turks-cap." 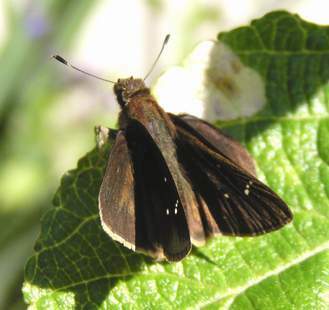 Larval Host - trees such as cherry, cottonwoods, willow. 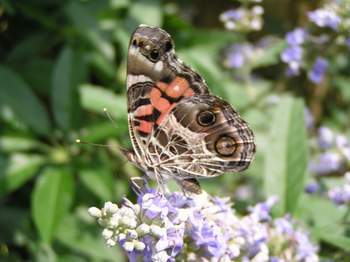 Nectar - Butterfly Bush (buddleia davidii), butterfly weed, Lantana, lilac. 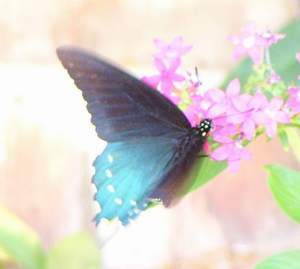 This dark form of the Tiger Swallowtail just loved the Lantana in my garden. She spent most of an afternoon visiting this as well as a few other plants around my yard. 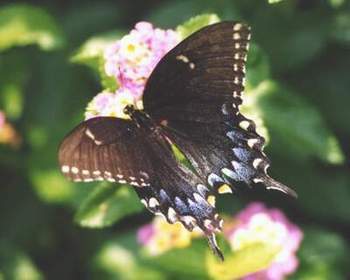 Similar to the Black form of the Eastern Swallowtail, and also enjoying lantana. Larval Host - Carrot family, parsley, dill. Nectar - Lantana, phlox, clover, butterfly weed, thistle. 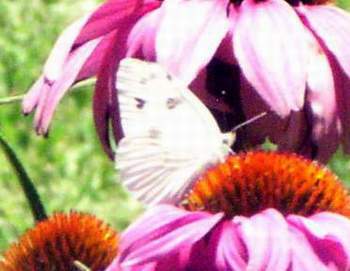 Here feeding from Penta & Purple Coneflower (Echinacea purpurea). 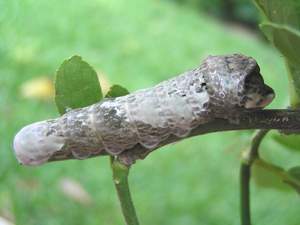 Larval Host - Species of Pipevine. Nectar - Buddleia, Lilac, Pentas, Petunias & Azaleas. This one was warming up on the sunny railway ties in the morning. 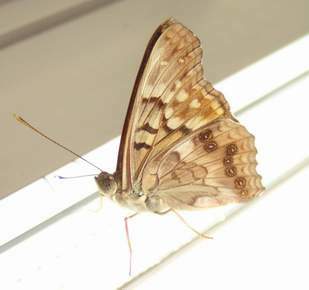 These Butterflies migrate and over-winter in parts of North America. They may make use of roosting boxes if provided as well as wood piles. Larval Host - Hackberrys, Elm's, Nettles. 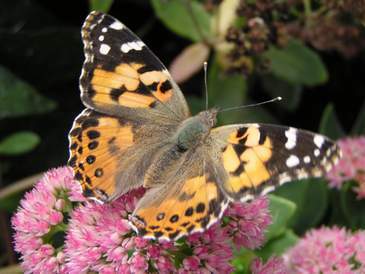 Red Admirals, along with several other species of butterfly do not feed so much on flower nectar but get their moisture and nutriends from things like rotting fruit, tree sap & wastes such as dung instead. 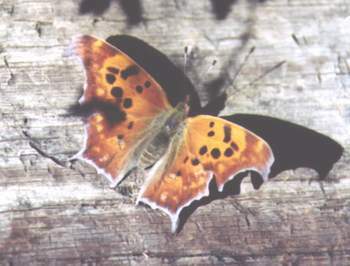 A plate of rotting fruit, some beer and yeast will attract this kind of butterfly. Nectar - Aster, Buddleia, Marigold, Goldenrod. 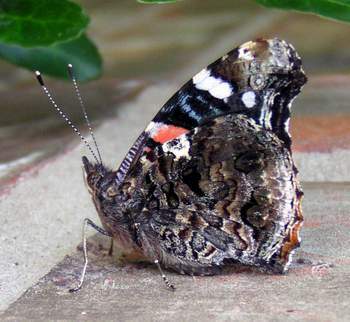 Very similar to the American Lady, but with more "eyes" on the underside of the hind wing. Feeding here on Salvia "Indigo Spires"
Larval Host - Thistle, Mallow, Hollyhock. Nectar - Cosmos, Thistle, Aster. Nectar - Aster, Chicory, Knapweed, Coreopsis. 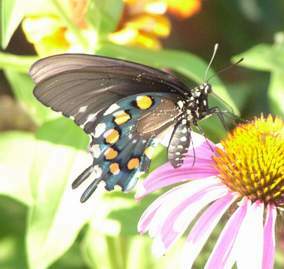 Seen mostly on my Coneflowers. They are very restless and you have to be quick with the camara! Larval Host - Mallows and Hibiscus family, also clover. Nectar - Coneflowers, Milkweeds, clovers, Goldenrod. 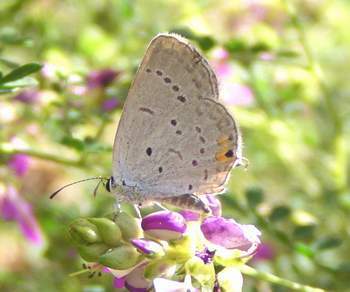 This Hairstreak is north of its usual range of southern Texas but some years will wander to the northern counties. 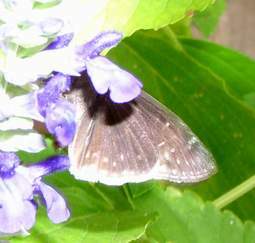 Seen here on "Blue Daze"
The Dusky-blue's range is the Southern half of TX but this one was feeding from flowers in my garden in North central Texas. Some years they obviously wander north. 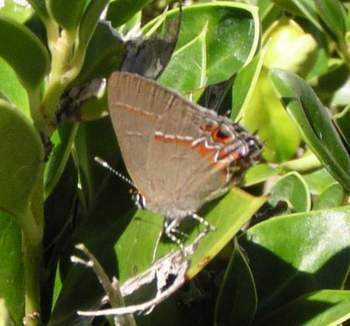 They will also occasionaly hybridize with the Red-banded Hairstreak found in the Eastern US, west to Central TX. 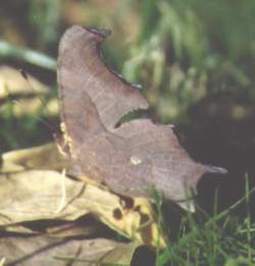 Larval Host - Rotting leaves for both butterflies. 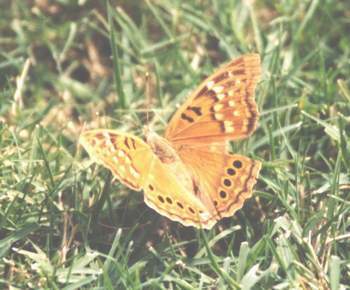 A common Eastern butterfly, visiting gardens, meadows and parks. 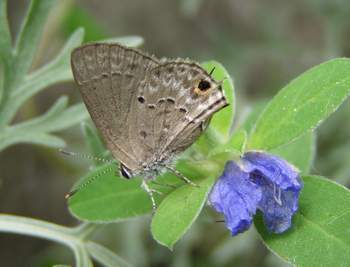 Here it's feeding from "Black Dalea". Larval Host - Species of legumes. 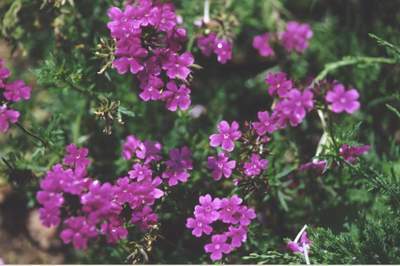 Nectar - Legumes, Black Dalea. Seen here on annual Perslane, they seem to like it close to the ground. Nectar - Aster, Composites such as Gloriosa daisy (Rudbeckia hirta), Thistle. 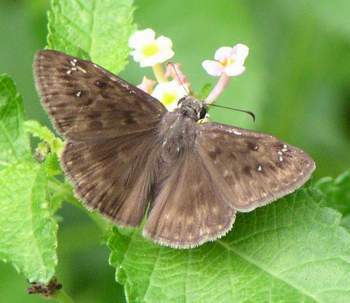 Part of the "Emperor" group, these butterflies tend to land on humans as apposed to flowers as they are attracted to the salt in the skin. Larval Host -Mustard family, Cabbage, Turnip, Beeplant (Cleome). Nectar - Coneflower (Echinacea purpurea), Butterfly weed, Aster, Centaury. Larval Host - Clover, Legumes, Alfalfa. Larval Host - Clovers, Legumes, Indigo bush. 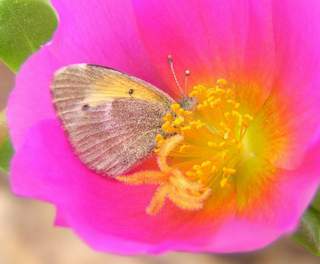 This is a small, fast & low flying butterfly, here feeding on Purslane. 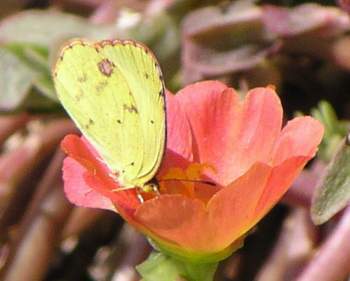 A tiny butterfly, yellow and olive green in color, both feeding on purslane. 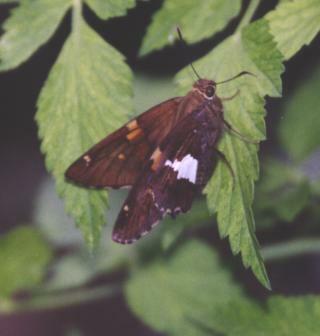 Larval Host - Oak species - "Mulenberg's, Gambel, Texas". Nectar - Blue Salvia, also Lantana. Found along woodland edges and clearings. Here on both "Verbena" & "Indigo Spires Salvia." 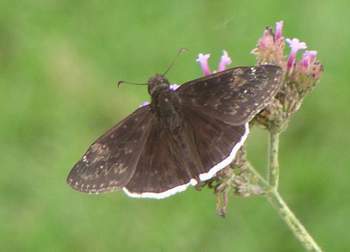 Similar to the Zarucco Duskywing but with brighter white fringe. 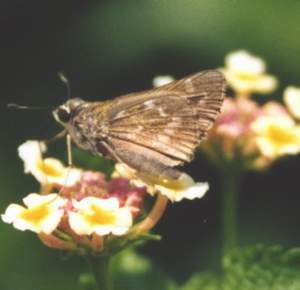 The most common skipper in North America and flies all year in southern regions. 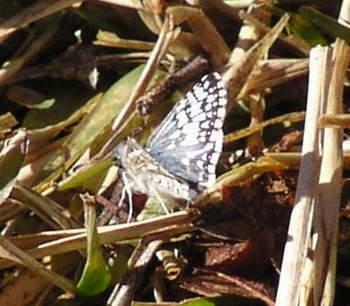 Also essentialy the same as the White Checkered-Skipper (Pyrgus xanthus) found in hot and dry regions of the Southwest. Larval Host - Mallows, Hollyhocks. Nectar - Asters, Fleabane, Shepherd's Needle, Knapweed. 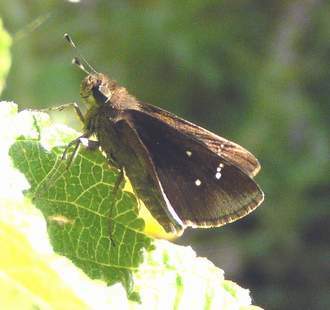 A common garden Skipper, this one is always seen on my wisteria vine laying eggs. Larval Host - Wisteria, Locust, licorice. 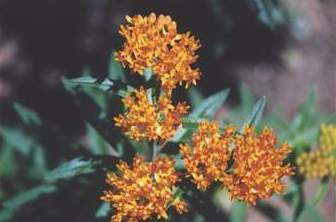 Nectar - Honeysuckles, Butterfly weed, zinnias, joe-pye-weed. 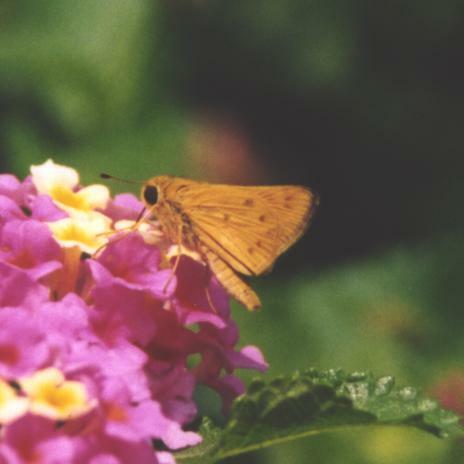 A nice bright skipper, often seen with Whirlabout and Sachem skippers, is visiting lantana. Larval Host - Grasses such as Bermuda and crabgrass. Nectar - Lantana, Aster, Marigold. 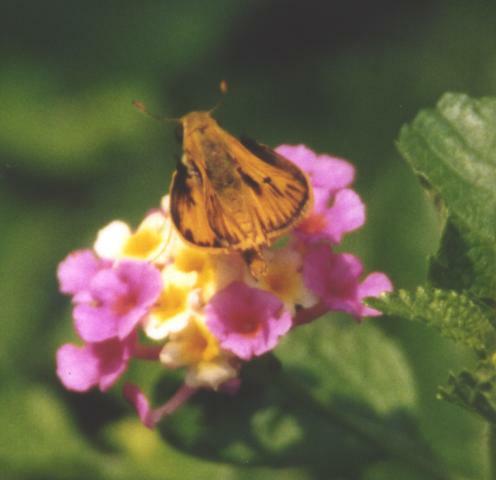 Seen here on the lantana alongside the Fiery Skipper above. Larval Host - Bermuda, crab grass. Nectar - Aster, Butterfly weed, Lantana, Marigold, Buttonbush. 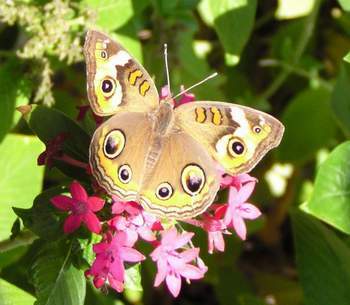 Basking on Sedum & lantana. 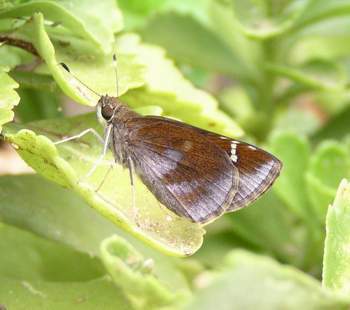 Often perch on low plants. Larval Host - Weedy Grasses. 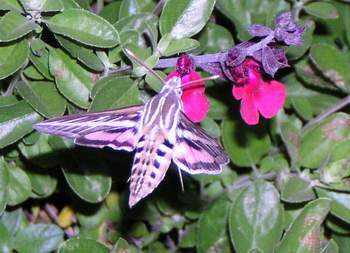 This 3 inch Hummingbird Hawk Moth was perched during the day on a Nandina plant growing by my pond. It sat perfectly still while I rearranged the leaves around him to take the photo! Larval Host - Purslanes, Portulcas, Evening primrose. Nectar - Dianthus, Salvia, Portulaca. 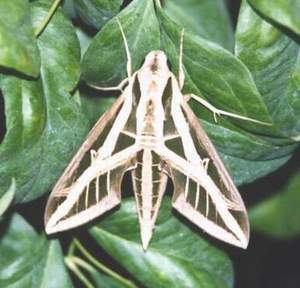 I managed to get this photo at dusk with a flash while it fed from a Salvia plant. I just spotted its movement and realized what it was! Larval Host - As above. 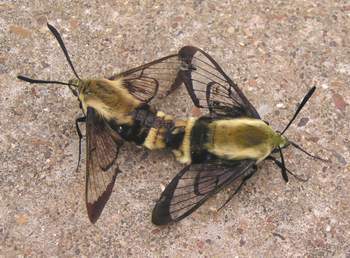 This pair just happened to land on our driveway in the middle of the day and are known as day-flying moths.